A variety of computer users have come to IPAT’s Technology Access Centers with an inability to use a standard mouse. The reasons have been many; shoulder pain when reaching to use a mouse, the reliable use of only one finger on one hand, lack of stamina over time to manipulate and click a mouse, and arthritis of the hands. For these individuals with limited hand, finger or arm movements, the numeric keypad, found on most keyboards, turned out to be an excellent mouse alternative. Best of all the solution is readily available, and FREE! 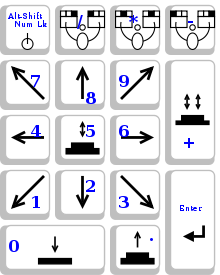 The graphic identifies the numeric keypad and key functions when it is used as a pointing device. Be a problem solver, offer this simple solution to someone you know having trouble with a standard mouse – it may be just the answer they need.